Rat anti Human Interleukin-2 antibody, clone MQ1-17H12 recognizes human interleukin-2 (IL-2), also known as T-cell growth factor or Aldesleukin. IL-2 is a 153 amino acid secreted cytokine produced by T-cells following antigenic or mitogenic stimulation. It plays a crucial role in T-cell proliferation and immune regulation. 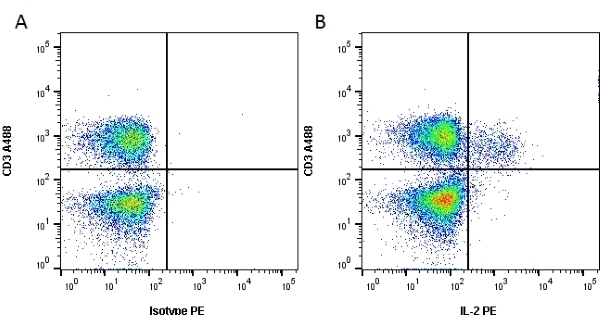 Rat anti Human Interleukin-2 antibody, clone MQ1-17H12 has been sucessfully used for the detection and measurement of native and recombinant human IL-2 using flow cytometry and ELISA where it ascts as the capture reagent in a very sensitive assay for IL-2 determination in human samples. IL-2 is used extensively for the treatment of patients with metastatic melanoma (Atkins et al. 1999) and renal cancer with reproducible benificial effects (Rosenberg 2014). Monitoring of IL-2 levels in such patients is required for optimization of treatment regimens (Lotze et al. 1986). Rat anti Human Interleukin-2 antibody, clone MQ1-17H12 is also useful for evaluating levels of IL-2 in patients with autoimmune conditions including lupus erythematosus and rheumatoid arthritis where there may be an impaired ability to produce IL-2 (Talal et al. 1983). Garbe, Y. et al. (2011) Semiallogenic fusions of MSI(+) tumor cells and activated B cells induce MSI-specific T cell responses. Moncrieffe, H. et al. (2010) High expression of the ectonucleotidase CD39 on T cells from the inflamed site identifies two distinct populations, one regulatory and one memory T cell population. J Immunol. 185 (1): 134-43.